he Variable Mu Limiter Compressor is the GLUE that holds the mix together while crystallizing it into a professional, final product. All-tube, all transformer, an all-American legend. High Pass Side Chain mod now comes standard. 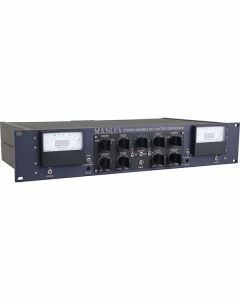 The Manley Variable MU Limiter compressor has been Manley's best-selling product for many years. One of an elite selection of compressors, it has underpinned most hit records over the last decade, and probably the next. As a result, it comes as standard in most mastering studios. "Mu" is tube-speak for gain, and Variable Mu is Manley's registered trademark for this limiter compressor. It functions by utilising the "remote cut-off" or re-biasing of a vacuum tube to attain compression. The invaluable vintage Fairchild 670 also uses this system and is one of few all-tube compressors to do so. Even the side-chain has glowing rectifier bottles. The sharper knee “limit” mode begins at 4:1 and changes to a more intense ratio of 20:1 when limiting over 12dB, the “compress” mode is soft-knee 1.5:1 ratio. The knee actually softens as more limiting is deployed. Turning up the Input and turning down the Output while using very little or no compression is also a creative method of producing distortion. Usually down 1-3db at 100 Hz, and down 4-6db at 50Hz, the MU’s filter is a very gentle 6db per octave one pole filter. As you reduce the frequency, the amount of limiting will reduce also. There should be very little gain reduction at the far end of the low frequency spectrum (less than 20Hz). The whole intent of Manley’s filter is to keep low frequency signals (like a heavy kick drum) from activating the compression/limiting so that the overall level doesn't duck with every drumbeat. The High Pass Side Chain mod comes as standard on all Manley Variable Mu limiter/compressors for both regular and mastering versions. When activated the side chain will not reply to frequencies lower than 100Hz. Functionally, this means adding two switches to the front panel, one for each channel. The mod can be used for music with heavy bass lines or bass-heavy mixes where you don't want the bass driving the whole action of the compressor.